The risks of bicycle collisions go up in the summer, and adults make up the majority of bike accident victims, according to the National Highway Traffic Safety Administration (NHTSA). Adults often decide to commute to work or ride bicycles for exercise in the summer, which puts them at risk of becoming involved in accidents with drivers who do not understand how to safely share the road with bike riders. Both drivers and bicycle riders need to know what the rules are for co-existing safely and should ensure they exercise reasonable caution to avoid bike collisions. 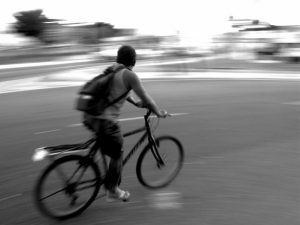 A Boston bicycle injury attorney can represent victims of bike crashes who believe a driver’s carelessness was the direct cause of a bike crash. If a bike rider can prove a driver was to blame for causing an accident to occur, the bicyclist can obtain compensation from the driver’s insurance for economic and non-financial loss by making a successful bike injury claim. Bicycle riders, however, want to avoid the damage a bike accident can do and so should take some basic safety steps to try to minimize the chances an accident will happen. Follow the rules of the road: Bicyclists in Massachusetts are allowed by law to use virtually all public roads, with some exceptions, such as when signs have been posted prohibiting bicycle riders. However, bikers must follow the rules of the road, including obeying traffic signals and yielding the right-of-way when required. Stay in bike lanes or in designated bicycling areas: When possible, try to ride your bike in areas set up to be safe for bicycle riders. This means choosing routes with bike lanes and riding in parks or on trails or other safe locations when you are just riding for recreation. Watch for pedestrians: While cars are the biggest risk to you as a bicycle rider, you present a danger to pedestrians. Watch carefully for walkers and follow the rules, including not overtaking pedestrian without an audible signal. Wear brightly colored clothing: Bicycles are much smaller than cars and many drivers simply miss seeing riders. You want to make yourself as easy to see as possible, both during the day and at night. Wear brightly colored clothing when you can do so to make it easier for drivers to spot you. Use lights and reflectors when riding a bicycle at night: More bike accidents occur after dark when it is more difficult for drivers to see bicycle riders. Massachusetts law requires bicycle operators to affix a “lamp emitting a white light visible from a distance of at least five hundred feet” to the front of the bike and a red reflector to the back when riding after sunset and before sunrise. Using lamps and reflectors on your bicycle when riding after dark makes it much easier for drivers to see you when you are riding on roadways. Unfortunately, even when bicycle riders follow all of the best practices for safety, they can still be hurt by a careless driver who is not paying attention or who behaves negligently and crashes into them. When a bicyclist is harmed because of a driver’s actions, the bike rider should talk with an attorney about pursuing a claim for compensation as soon as possible after the crash.